Action Comics #13 is many things. A tale of revenge. A ghost story. A Halloween tie-in comic A tribute to the writings of Ray Bradbury. A parable about the power of faith and the inevitable triumph of good over evil. And yes, it is even a story about a boy and his dog..
Our plot centers upon Dr. Xa-Du - the first criminal to be sent into The Phantom Zone. Sentenced to "total physical dematerialization" for his experiments in suspended animation which "unleashed the horror of living death" on Krypton, Xa-Du is quick to swear revenge on his accusers. In particular he singles out the scientist who discovered The Phantom Zone and suggested it as an more humane alternative to the previous methods of criminal punishment on Krypton - Jor-El a.k.a. Superman's dad. Does this seem a bit familiar? A bit. The trial scene and subsequent scenes in the Phantom Zone are totally cribbed from the Superman movies, with Non and Ursa being among the other criminals eventually sentenced to The Phantom Zone and one figure says "Kneel Before - " before getting cut off. But Grant Morrison has proven his ability to take classic superhero cliches and make them seem new and exciting time and time again and does it again here. How does he do it? By emphasizing the horrific elements of Xa-Du's experiments and confirming that he almost caused the Zombie Apocalypse on Krypton. Some Kryptonian criminal escaping from the Phantom Zone and trapping Superman inside it? Not that new. 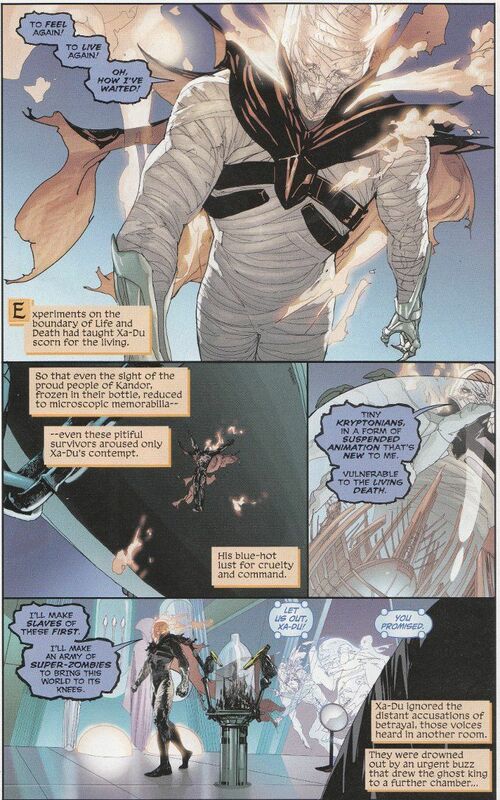 A Kryptonian criminal escaping from the Phantom Zone using an "ecto-suit" that makes him look like a mummy, who traps Superman inside it so that he can begin a new reign of terror backed by an army of super-zombies? NOW we're cooking with super-gas! Truly, this story is so awesome that not even the inclusion of Wandering Judas (I refuse to call this character The Phantom Stranger as he isn't a stranger and outright tells Superman who he is!) can weaken it. Not in the face of the concentrated furry ball of awesome that is Krypto The Super Dog. Yes, Krypto - the family hound of the House of El - is still alive. Trapped in the Phantom Zone while protecting a young Ka-El from an inter dimensional attack, he has been there for many years, watching and waiting for his young master to return to him after apparently tracking him part way across the universe by smelling him. Does this make a lick of sense? No. Do we care? Not really. Because the idea of a ghost dog that can track someone across the whole of space and across the dimensional divide is just awesome. 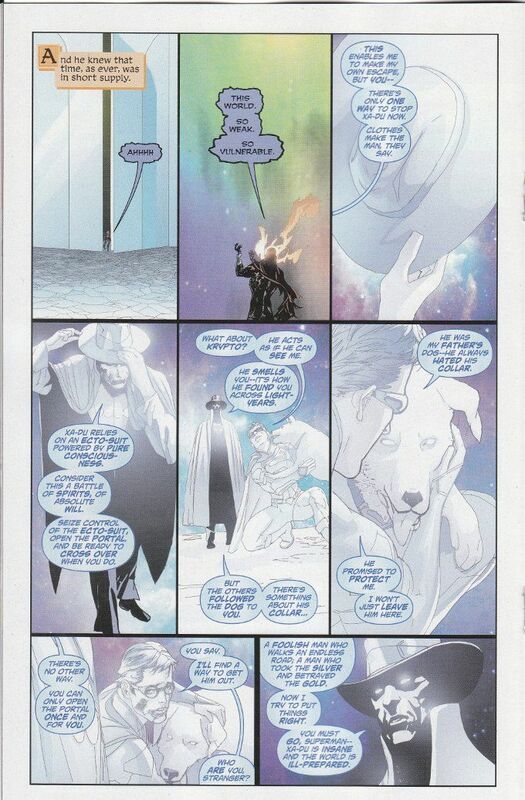 And the concept becomes even more awesome in the back-up story by Sholly Fisch, where we see that Krypto has been watching over young Kal-El for quite a while. The artwork for the issue is generally as impressive as the story. Travel Foreman, who penciled the main story, does a fine job with The Phantom Zone sequences, using light inks on the ghostly figures trapped in the Zone while heavily shadowing Xa-Du in the far-shots to visually emphasize his own dark corruption. The color palette by Brad Anderson also helps emphasize the three levels the art plays upon. The only problem I can see is that Foreman's design for Krypto seems inconsistent, with Krypto largely resembling a husky or short-eared wolf-hound in most panels but suddenly having longer, floppier ears in some panels as above. 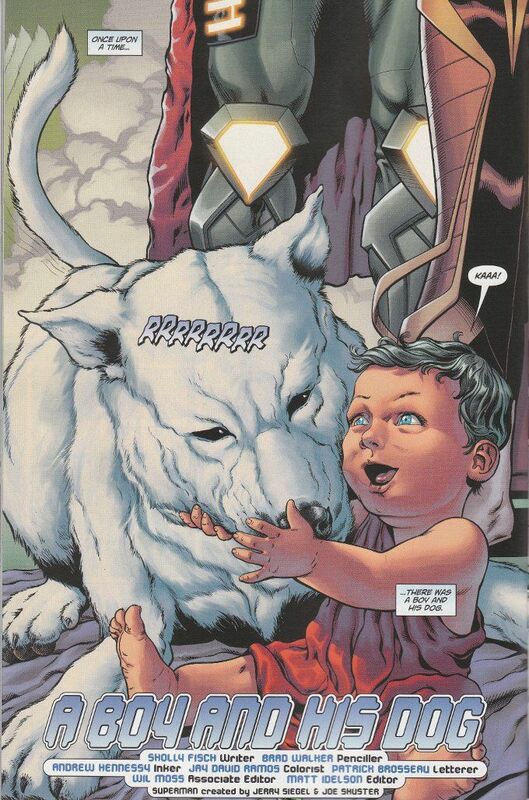 The artwork in the back-up story, by Brad Walker and Andrew Hennessy is more consistent, with Krypto clearly defined as a more wolfish breed as opposed to the Beagle-like breed we're used to seeing. This issue is a wonderful jumping on point for those of you who have resisted the draw of Action Comics up until now. It would also make a fine gift for any dog lovers you might know or anyone looking for an unusual ghost story this Halloween.